It was on the 11th February 1858, when the Immaculate Virgin Mary appeared to Bernadette Soubirous in the Grotto of Massabielle in Lourdes, France for the first time. Eighteen apparitions took place in all and Lourdes soon became a center of pilgrimage and prayers. It was Christianity’s foremost pilgrim site. The harbor is dominated by a Gothic church that fits Mgarr hill like a royal crown but whose existence may be owed to a mundane traveler. In 1879, it is said, some visitor pointed out that the rocks of the hill were similar to the Grotto of Massabielle in Lourdes. Only 21 years had passed since young Bernardette was honored with visions of Our Lady. So the pious Ghajnsilmizi could not take such a remark lightly. A statue of Our Lady of Lourdes soon appeared in the rocks. The church itself was finished nine years later. Soon after World War II ended, an artistic marble altar was added to the imposing Lourdes Church, whose parvis commands splendid views of the harbor. 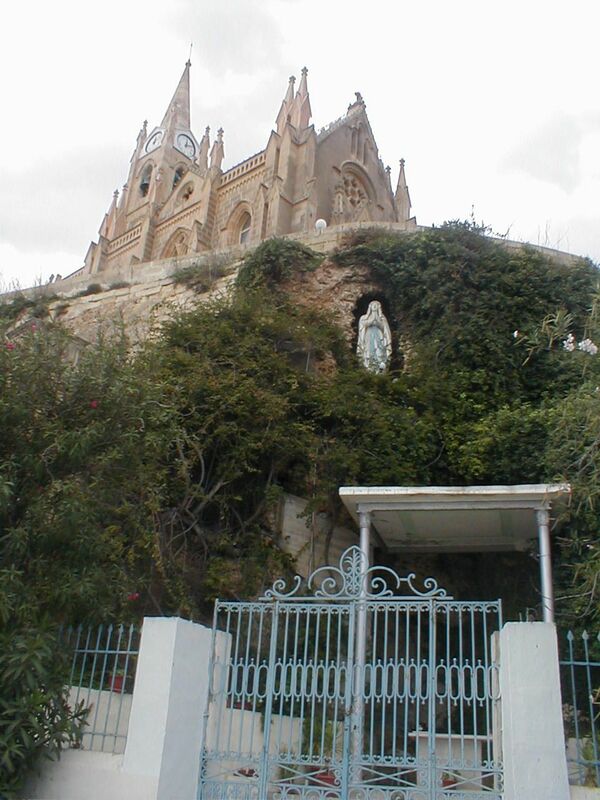 The chapel of our Lady of Lourdes, built on a hill used to be known ‘tal-Qortin’ overlooking Mgarr harbor. This was built in the year 1888. The work was finished by the Maltese architect Caruana Galizia on a Gothic style. This is a place of pilgrimage for people from all over the island, especially in the days coinciding with the ‘visions of Our lady of Lourdes’ in southern France. The benefactor of the statue was Carolina Mamo and the artist was Carlo Darmanin. On 25 May 1879 the statue of Our Lady of Lourdes was put in her place and blessed on 3rd June 1883 by Bishop Pietru Pace. Works on this chapel were finished on 6 February 1892 and a year later, in 27th August 1893 it was blessed by bishop Giovanni M. Camilleri. The feast is celebrated on 11th February (the date of the first apparition). People from all over Gozo flock to the chapel and many return on all eighteen apparitions to pray and to hear mass.